UPDATE: Due to the request by Paramount Pictures Corporation, I am respectfully removing and replacing unreleased “Teenage Mutant Ninja Turtles” motion picture(s) with generic, fan made TMNT images to represent and hold the place where those images were. Be prepared to be shell shocked! Wait, that's a bad pun but it's not as bad as the new designs that are being leaked for Michael Bay's rendering of Teenage Mutant Ninja Turtles. Ok, so sure, the TMNT have almost 30 years of history to be worked with. But how much of it is actually important enough to be made into the movies? So that's... 26 years of Mirage's Teenage Mutant Ninja Turtles? But Volume 3 has no importance. Peter Laird decided that Volume 3 is not "canon" or "official. "That brings us to to 1984-1995 (11 years) and 2001-2010 (9 years). Most of those story lines and arcs were small and isolated. Shredder himself wasn't even a big deal. Hell, he was even killed within the first night he fought the TMNT. He actually wasn't even to hold much ground against them and committed Seppuku rather than die by their hands. The Foot Clan would use clones, Karai, and other means to haunt the Ninja Turtles with the shadow of the Shredder, but he remained dead. Don't believe me? Check it here. The original image that was here was Michael Bay's Transformers Megatron plus Power Rangers' Lord Zedd equaling this new movie Shredder because that is what the image looked like to me. The image that was here was the original Jim Henson's studios Leonardo plus Turok the Dinosaur Hunter equaling the new movie's Leonardo because he wears a strikingly close set of armor. 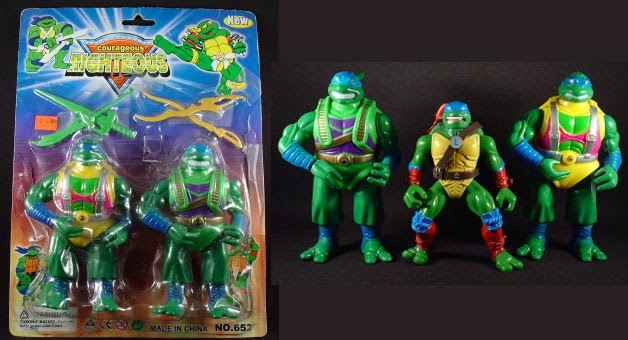 These knock off Ninja Turtles are almost a fair and accurate representation of what the new TMNT look like though! I'm hoping that this is a final assault... "City at War" design. To me, the TMNT never really war armor unless it was for a final showdown, last resort, all chips are in... kind of battle. 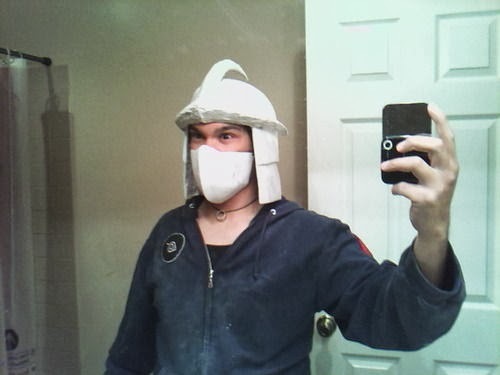 With that menacing looking Shredder? It can work. But if that's the look for the whole movie? It's going to be taking away from the elements that I like about the Teenage Mutant Ninja Turtles; that there plastron is their armor. Besides that, what is bothering me? The nostrils? The over muscular designs? The scales? The too human looking face? Yes, all of the above. I'm afraid to see what Splinter is going to look like. This article is pretty much a knee-jerk reaction to the images I am seeing and the information I keep hearing about how and where Michael Bay and his team plan on altering the Teenage Mutant Ninja Turtles I grew up with. I know it was not a perfect movie, but TMNT from 2007 was great. 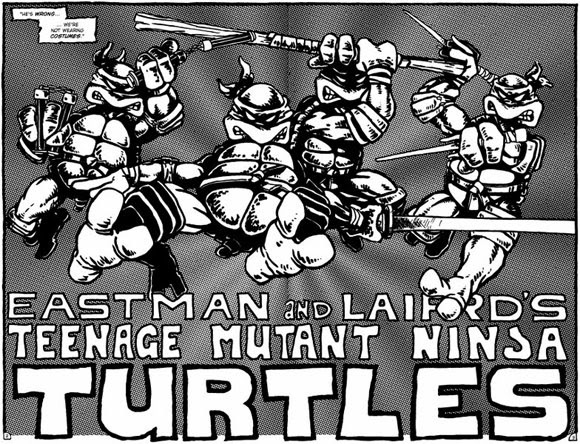 It was for kids, had limited back story about the Teenage Mutant Ninja Turtles so anyone can enjoy it, and it kept the Green Team true to their forms. What I see right now? This is making the Bayformers series look great. While the robot form designs may have lacked, at least the concept of alien robots that turned into vehicles kept, the important characters (Optimus Prime, Megatron, Starscream, etc) stayed almost true to their source material.